City councilors in Boston say despite the initially prickly reception to e-scooters, they’re motivated to do something amid the city’s ever-worsening woes with city traffic congestion and related public health concerns (including crashes, pollution and delayed emergency response when seconds count). One of the biggest hurdles that must be cleared before launch is the way Massachusetts law defines motor scooters. State law on e-scooters (aka “motorized scooters”) is outdated and raises more questions than it answers. E-scooters aren’t exactly bicycles. They aren’t motor vehicles either. Most agree they don’t belong on sidewalks, where a machine traveling 20 mph would be be dangerous to pedestrians (especially those disabled and with hearing problems). They probably wouldn’t be safe for e-scooter riders either. The statute – MGL Ch. 90 Section 1E – refers to “motorized scooters” as “devices,” as opposed to “vehicles.” This and other elements seemingly would have e-scooters in Boston treated much like bicycle traffic. Bicyclists don’t need an operator’s license. E-scooter operators do – both according to state law and companies like Bird. 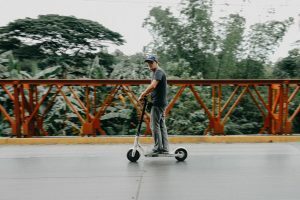 Where the law starts to run in circles is in defining the features of “motorized scooters” – which is the closest description that exists in statute, grouped with electric bicycles, but then also in the same class as motorized bicycles (like a Vespa). Motorized scooters can have two or three wheels, handlebars, be sit-down or stand-up, powered either with an electric or gas motor capable of motion without a person pushing, pedaling, etc. Motorcycles (motor vehicles with saddle or seat for use of the rider designed to travel on a maximum 3 wheels all on the ground; can include a motorized bicycle). Motorized bicycles (pedal bicycles with a helper motor or non-pedal bicycle with a motor, automatic transmission, maximum 50 cubic centimeters and tops out at 30 mph speed). The statute refers to motorized scooters as “devices,” while motorcycles are “vehicles.” However, because motorized scooters expressly cannot also be motorized bicycles, it has to be either stand-up with no pedals, powered electrically, have an engine larger than 50 cc., equipped with a manual transmission or travel more than 30 mph (in which case it would actually be a motorcycle – a vehicle, not a device). So there is still some question as to exactly which rules will apply. And there are operational rules and restrictions on motorized scooter use in Massachusetts that are questionable and could prove problematic. Motor scooter rides are limited to the hours between sunrise and sunset. Operators are required always to pass on the right (which could be quite dangerous). As a long-time Boston safe cycling advocate, Boston bike injury lawyer Andrew Fischer has worked closely over the years with state lawmakers to draft Massachusetts bicycle legislation that later became law. State lawmakers are likely to be confronted with prioritizing this issue – because e-scooters are coming whether the Commonwealth is 100 percent ready. For sake of public safety, lawmakers must commit to a thorough review and statutory updates that will clearly reflect the modern e-scooters. It’s unclear though whether Boston will wait for that to happen (which would almost certainly not happen by spring) or if officials will move forward with their own interpretations and ordinances in the meantime. It’s likely community leaders and their attorneys will be conferring with legislators in the weeks before the roll-out to ensure no major hiccups. Finally, one issue likely troubling (at least for Bird) is their fleet isn’t isn’t compliant with state law on motorized scooters (it’s not clear from The Boston Herald whether the other two are). They don’t have turn signals or brake lights, both of which are required to be road-worthy under the state’s motorized scooter classification. It’s not clear yet whether the Bird e-scooters to be altered before Boston allows them to on-board, whether enforcement may be relaxed pending legislation or if Bird may wait until the law is addressed.